Since we saw the first Kepler card, the Nvidia GeForce GTX 680, in cool, crisp sunny San Francisco, we’ve been itching to get our mitts on the more sensibly priced versions of the new architecture. The GTX 680 is still sitting over the £400/$500 mark a few months after release and, given the Nvidia GTX 580 didn’t have to drop its price throughout its lifespan, we doubt it will change much. Since then we’ve seen the Nvidia GeForce GTX 690 tip up, the graphics equivalent of the race spec sports car, all injection-moulded magnesium and multiple GPUs. So a cut-down version of the GTX 680 is what we’ve been after, and what we’ve known was coming, since Kepler first fired up in our test bench. 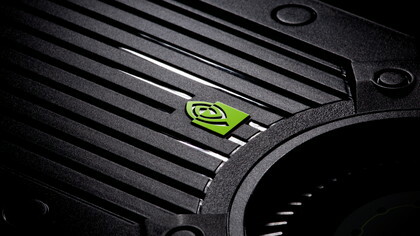 With the Nvidia GeForce GTX 670 that’s exactly what we’ve found ourselves facing. But we’re still not calling this the real mainstream Kepler card, that will come in the shape of the GTX 660 that is yet to come. This GTX 670 is aiming squarely at the market currently inhabited by the AMD Radeon HD 7950, so we’re talking about a £330/$400 graphics card here. When Nvidia says it is using the same DNA as the Nvidia GTX 680 for the GTX 670 it’s not just trying to hang on the coat-tails of the current top-end single-GPU card. From the Nvidia GTX 570 to this GTX 670 then that’s a massive 180% increase in CUDA cores. It’s this exponential rise in core count that eases any speed issues that would have otherwise arose in making the CUDA cores run at half the speed they were in Fermi. Other than the clockspeed, and the sheer number of them though, the CUDA cores in Kepler are identical to the ones that we’ve had in Fermi for years. Well, the real big news is down to the Intel Turbo Boost-aping GPU Boost. Nvidia has been very open about the fact it is standing on the CPU company’s shoulders on this one. The big change has been to move the power circuitry to the ‘west’ side of the chip. That pushes it close to the bracket side of the board and has created a great deal of space at the end of the card. 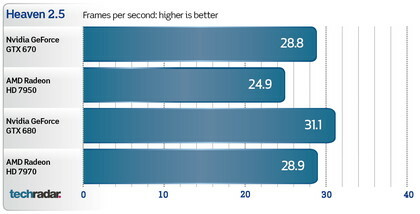 The straight-line performance of the Nvidia GeForce GTX 680, with its ever-so-slightly pared-back GK104 GPU, is impressive. Up against the GTX 680 it’s only just off the pace, but put it up against either of AMD’s top Southern Island cards and it’s a winner. It’s around the same price as the Radeon HD 7950 and performs as well, on average, as the AMD Radeon HD 7970. In SLI configuration too the second tier Kepler card is a beauty. It’s significantly cheaper than the crazy-expensive GTX 690 and gets incredibly close in performance terms. The GTX 680 pairing is still the performance choice, but needs a hefty PSU and some neat air-flow configurations to keep them working happily in the confines of a PC chassis. All the benchmarks were run on the highest comparable settings at the eye-popping 2560×1600 resolution, apart from the Shogun 2 test which was run at 1920×1080. The performance of the Nvidia GTX 670 should come as no surprise considering it’s got pretty much all the goodness of the top-end GeForce GTX 680. With only a single SMX module missing from the make up of the GK104 GPU that powers both graphics cards, the GTX 670 has only lost 192 CUDA cores and still retains 1,344 of them. That means that it’s only fractionally short of pace compared to the GTX 680 big brother. The fact Nvidia has also seen fit to stuff a full 2GB of seriously fast (6GHz) GDDR5 memory onto the PCB, the self same stuff backing up the GTX 680, serves to keep things going at full-fat resolutions too. This then is a card that’s still more than capable of keeping your 30-inch panel fed with pretty pixels. You can though see why Nvidia has chosen to hold the GTX 670 back a few months – if both the top Kepler cards (crazy-powerful, dual-GPU GTX 690 notwithstanding) had been released at the same time there would have been some fisticuffs between the two of them. With an expected £100/$100 gap between the two cards there’s not a lot more performance you’re getting with the GTX 680 over the GTX 670. It’s a scant few frames per second at best. 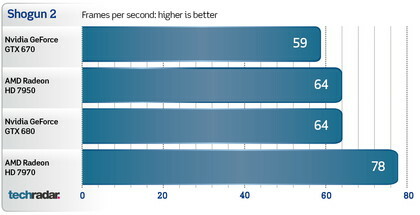 That only means good things for our GTX 670, and even more so when compared with the AMD-shaped competition. Throughout all the pre-release briefings Nvidia has been talking about going head-to-head with the AMD Radeon HD 7950, but that is only in price terms. 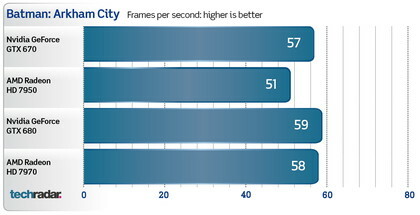 The real performance comparison has to be with AMD’s current top card, the AMD Radeon HD 7970. And that comparison isn’t particularly favourable towards the Texans. The HD 7970 has dropped considerably in price in recent times, to the point where it’s now only £60/$80 more expensive than the HD 7950, which still makes it pricier than the GTX 670. And on balance it’s pretty level. 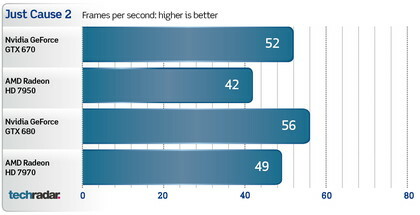 In some benchmarks the Nvidia GTX 670 takes the lead and in others the AMD HD 7970 has the edge. It’s only in Shogun 2 though that the difference is particularly pronounced, by almost 20 frames per second. That is the exception with the competition being mighty close in everything else. As with the GTX 680 the overclocking performance of this Kepler Nvidia GTX 670 is mighty impressive. Nvidia may be limiting the base clock to 915MHz out of the reference box, but it will happily offset much higher. Our reference board was running stably with a 130MHz offset, which gave us regular gaming boost clocks of around 1,215MHz. And all that with a still rather healthy temperature too. We did have to crank the fan up to 60% for that, but even that didn’t give offensive noise levels. Indeed at that sort of speeds the noise was easily on par with the competing AMD Radeon HD 7970. 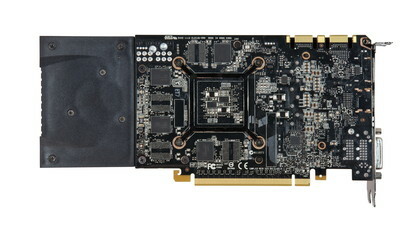 This Nvidia GeForce GTX 670 then is one of the Kepler cards we’ve been desperately waiting for. The second tier cards, and lower, in the Kepler line up were always going to generate more interest than either of the overly expensive GTX 680 or GTX 690. And they’re going to sell a hell of a lot more too. 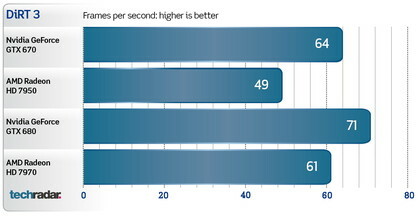 The key thing here though is that there is so little difference in performance and architectural terms between the Nvidia GTX 680 and GTX 670. In fact with the frame rates you’re getting with the Nvidia GeForce GTX 670 it’s going to be rather difficult for us to recommend anyone buying the GTX 680 if they’re going to leave it at stock speeds. You can push the GTX 670 to the sort of performance that’s really knocking on the door of its Kepler big brother. But then if you’re into your overclocking and can spend the extra on the GTX 680 there is a bit more performance waiting inside that version of the GK104 GPU. The issue for the consumer of whether they can afford, or even need, the extra performance the GTX 680 has to offer over the GTX 670 must have Nvidia’s money men rubbing their hands with glee. The issue at the top-end is not whether to buy AMD or Nvidia, it’s just which Nvidia card to opt for. The Nvidia GTX 670, if it comes out priced against the HD 7950 as promised, will do bad things to any further sales of AMD’s top-end GPUs. 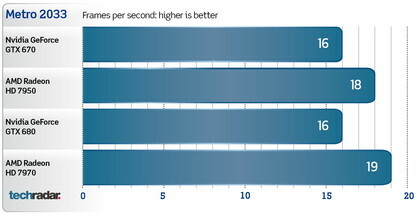 The head-to-head battle, in performance terms, is with AMD’s top graphics card, the Radeon HD 7970. 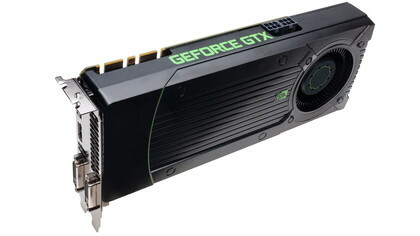 That card is priced higher than the GTX 670 and, on balance, they perform at about the same levels as each other. That’s got to be a little gut-punch for AMD, with its top card being out-played by Nvidia’s second tier component. 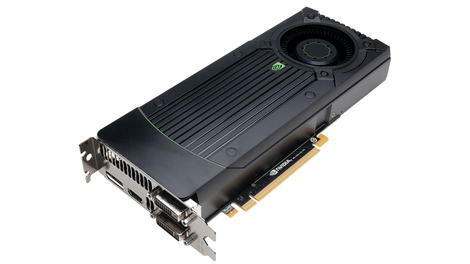 The green graphics giant has been able to wait on this card, seeing how the market unfolds and, by virtue of being late to the party, has been able to tweak performance and price to the nth degree. That means it has been able to aim both barrels at the two AMD Southern Island cards in its sights. That said, AMD has been able to keep prices high on its cards since the turn of the year as Nvidia struggled to get anything out onto the digital high street until now. Scratch that, we love the fact the Nvidia GTX 670 offers almost the same sort of gaming performance you get out of a stock-clocked GTX 680. If that’s bad news for the top single-GPU Kepler card it’s worse for the entire of AMD’s graphics division. Being on a par with the top Southern Island card, the AMD Radeon HD 7970, with it’s brand spanking new Graphics Core Next architecture, makes this second tier GTX 670 a comparative bargain. It’s also got all the goodness that comes with the Kepler architecture, namely the excellent performance per watt, great cooling and the incredibly impressive GPU Boost technology. There’s not a whole lot to dislike about the GTX 670 itself, but it’s tough not to be frustrated with the graphics ecosystem as a whole. The fact is that £330/$400 for a graphics card is a lot of money, especially for a second tier card. But that is what the market dictates thanks to the precedent AMD has set, and so for this performance we have to pay through the nose. It’s still comparatively good value against the £400/$500+ GTX 680, but feels like a lot of money to spend on a GPU. We’d have loved Nvidia to take a stand here for the PC gaming market and release a great card for a great price. It could have completely blown AMD out of the market, sold a shed load of cards and given the PC gaming market a real shot in the arm. The Nvidia GeForce GTX 670 is a great little card. The size of the PCB is impressive and will make for some interesting small form factor cards in the future. It’s almost GTX 680 performance for £100/$100 less, but at £330/$400 it still prices itself out of most pockets.